The IPA has kicked off the search for the 2018 Women of Tomorrow Awards, in partnership with Campaign. The awards, now in their fourth year, champion female talent across agencies, media owners and clients. They are designed to tackle the under-representation of women in leadership positions in the advertising, media and communication industries. 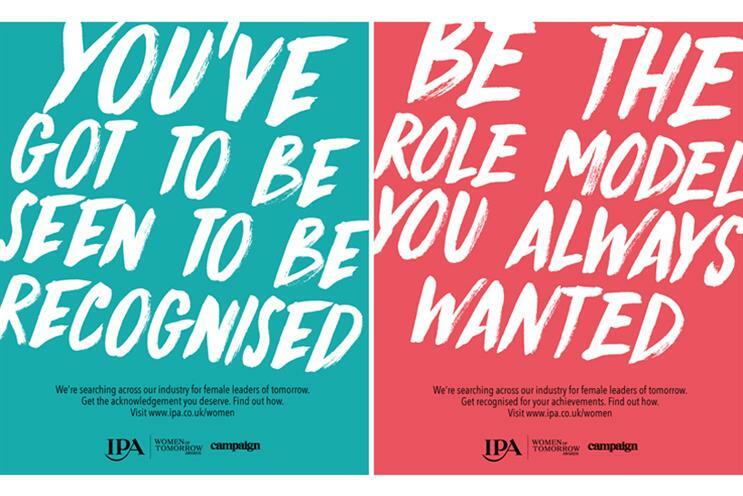 The IPA has set a target to bring female representation at a senior level to 40% by 2020 and the awards are one way in which the industry is championing female leaders. It is hoped that if women put themselves forward, or their colleagues recognise their leadership potential and nominate them it will help their careers build momentum. The awards will be co-chaired by IPA president Sarah Golding and Campaign's global editor-in-chief Claire Beale, with a shortlist of entries announced in February before an awards ceremony on International Women’s Day, Thursday 8 March. Beale said: "The Women of Tomorrow Awards are so important for the future our industry. These awards help us to celebrate the incredible women working in advertising, media and comms. I believe it is vital that young women starting their careers have strong female role models to look up to, and know that there should be no barriers to their success." IPA President and chief executive of CHI & Partners, Sarah Golding, added: "As a female chief executive and the second ever female IPA President in 100 years, this is a cause I am extremely passionate about the opportunity to celebrate the success of some of the brilliant women we work with is something I am very proud to be a part of." This year Engine has created a series of print ads to promote the awards and will also be producing a series of podcasts and an event to support the awards. Debbie Klein, chief executive of Engine Europe and Asia, said: "I hope this campaign encourages some of our industry’s hidden female talent to step out of the shadows and claim the recognition they deserve."